Is your Garden Cyclone ready? Do you know that most of the damage caused during cyclones is from flying debris such as palm fronds and unsecured items. I know it seems like the year flys by and all of a sudden it's the start of the cyclone season again and that time to get your garden cyclone ready. So it's time to prune those overgrown branches, clean all the dead palm fronds from the trees, but now you have another problem, with getting rid of all this garden waste. 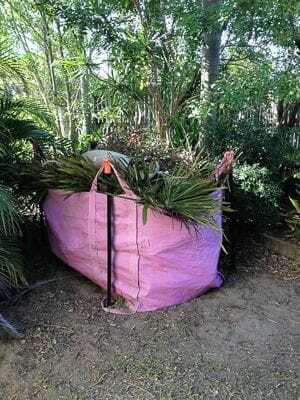 Aussie Skip Bags who partner with Aussie Palm Clean can provide you with an affordable solution with their Garden Waste Bags. These are availabe in three sizes and can be delivered and set up in your garden. You simply fill it with your Garden waste and then when you need it emptied we come and empty it for you. No more time wasted doing dump runs every weekend. No more trailer sitting there filled with palm fronds. Click here to arrange your Aussie Skip Bag. For anyone that has palms trees in their yard... We have some exciting news for you! Aussie Palm Clean and Aussie Skip Bags have joined forces! Mackay residents can now benefit from a full palm tree maintenance and palm nut and frond removal solution. Do you have palm trees in your yard that require cleaning or maintenance? Do you have coconuts or palm nuts that can fall and cause injury? Do you have a skip bag that can be filled and dumped at any time that suits you? Aussie Palm Clean and Aussie Skip Bags are a team of fully qualified professionals who specialise in prompt and reliable palm tree cleaning and can also assist you with removal of palm nuts and coconuts which may be hanging over your yard. With over 10 years of experience, there is no job too big or small for our team of experts and are proud to be the first number to call for fantastic palm tree cleaning and maintenance . Based in Mackay, we provide our excellent tree cleaning and maintenance services throughout the surrounding area and have satisfied customers from suburbs such as Sarina Beach, Proserpine, Seaforth and beyond. Our goal with our new website is to provide our visitors an easier way to learn about Aussie Palm Clean services and solutions. Our current and prospective clients will find useful information about our capabilities on the services page of our website. Amongst the new features the site contains integrated social media buttons for Facebook, Twitter and Linkedin to foster improved communication. We will be constantly updating our content with helpful information, blogs, newsletters, company announcements and client testimonials. We hope you find the new website with a fresh look. We would also like to thank Paul Price and the Bloomtools team for their amazing work and energy to help make this site what it is.